Yesterday, MLS Commissioner Don Garber stopped by the Fox Sports studios in New York City's Chelsea Piers to appear on the program "Crowd Goes Wild". He talked about (among other things) NYCFC, the Yankees and a potential location for our club's new stadium. Philbin: How about the New York Yankees getting involved in soccer? Garber: Very cool. It shows where the league is, Regis, you have the Yankees and Manchester City-club over in England-coming together, buying a team in New York City. That'll give us two clubs in New York. That'll start in 2015, hopefully in a stadium that will be - maybe even adjacent to Yankee Stadium. Garber: -having a soccer stadium in their backyard. Philbin: (overlapping) No. I think they'll be glad to have you in the Bronx! Garber: (overlapping) Yeah, the Bronx is cool. Philbin: (overlapping) Apparently close to the Stadium! 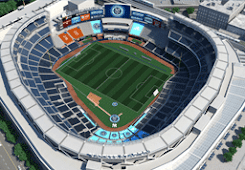 Garber: (overlapping) Subway ride, the Yankees having a stadium right next to their baseball stadium, could be very cool. That's the big news being bandied about today, although I don't think Garber said anything terribly newsworthy. We've known since August that NYCFC had zeroed in on a South Bronx site for the stadium, and that the Queens plan was dead. He didn't exactly break new ground there. Let's put it in perspective. Three hundred plus million people here, we represent almost every country from around the world, America is the largest purchaser of World Cup rights, more people go to Brazil from the US than will go from England or go from Jamaica or any other country from around the world, so our country really is a soccer nation. So that creates an opportunity, so when Manchester City comes here, or Tottenham comes here, or AC Milan comes here, it's a big market, that's a positive thing, the rising tide lifts all boats, MLS has got a lot of boats on that rising tide, so we benefit from that. Kroenke owning Arsenal and owning one of our teams is a positive, Man City owning a big team in the Premier League and owning NYCFC is a positive, all of that is us trying to create more and more energy so that America could one day win the World Cup. Real Madrid and Real Salt Lake have a business arrangement that goes beyond the ludicrous shared name. MLS obviously sees the world as getting smaller, and these international arrangements as increasing the visibility and viability of the American top flight as a whole. Love this blog. Had a question about NYCFC actually. Could you send me an email at hscribner@gmail.com?